Hello everyone, I hope you are all enjoying your week. This is my latest crochet baby poncho set that I have finished crocheting and I will be adding this to all the crochet and knit projects that I have made for our annual Crochet Sale at our church. Please Note: The pattern for the poncho can be found HERE. I do not have the pattern for the baby hat available. 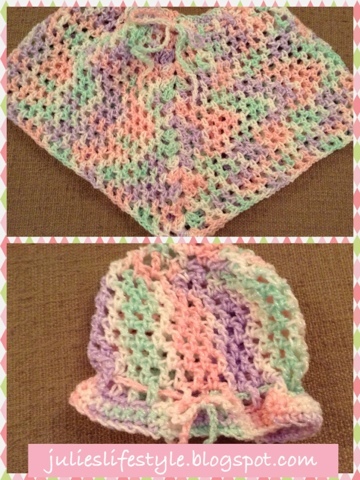 I really enjoyed crocheting this and the set will look adorable on a baby girl. The yarn I used is Red Heart Baby Econo in the color Rainbow Sherbet. May you have a great day. Hugs! That's just as cute as it can be! This set is so adorable! =) - such pretty colors! Im a new twitter follower. Melissa, thanks for your sweet comment and thanks for the follow on twitter. How pretty. I love the delicate colors of baby things. Today I bought some crochet thread and it's a soft pink and it's bamboo! It's so soft! Hugs! Hi Diane, have fun with your new yarn and thanks for the compliment. This is so adorable! I have a blanket that my grandma made for me in very similar colors and I love it! Thanks for your sweet comment Trisha. I love it! The colour is perfect. I love that type of yarn. I love your blog, which I just discovered via CrochetHappy. Chantal thanks so much and welcome to my blog! Hi Beca, yes it is fun and the lady's in the crochet group make such beautiful items for the sale. More Crochet, I'm like in awe... This is cute! Love the colors and it looks so cozy! Cute little poncho set...I had one when I was in grade school.